There are two types of exploding whales in this world. There are the whales that blow up with the assistance of explosives (à la this infamous example in Oregon), and there are the whales that detonate intrinsically, bursting apart when the gasses that accumulate during putrefaction become too voluminous to contain. 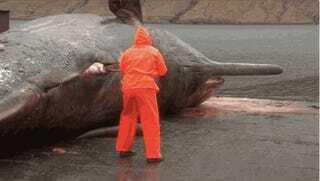 This whale, which recently exploded in the Faroe Islands, belongs to the latter camp. Big tip of the hat to Andrew "Planting Dynamite is Cheating" Thaler.